Two classic films from "The Singing Cowboy," one of America's greatest performers. 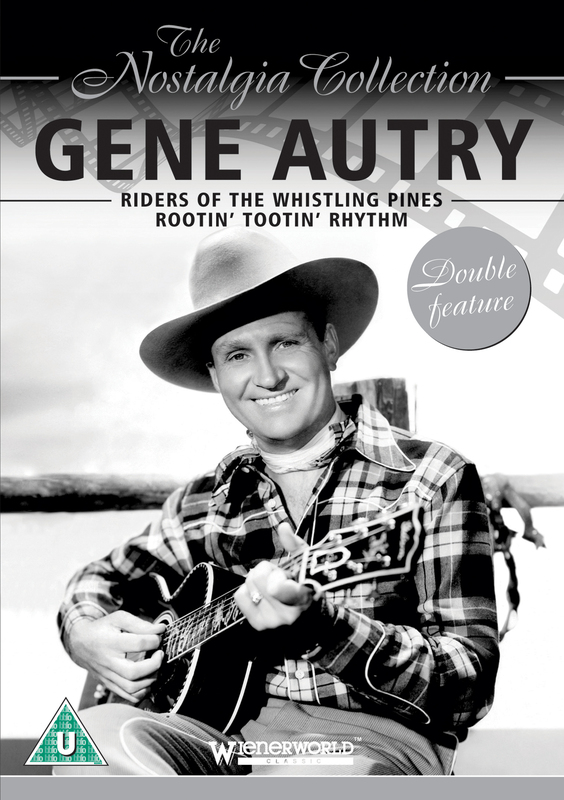 This DVD contains two classic Gene Autry films: Riders of the Whistling Pines (72 minutes) and Rootin' Tootin' Rhythm (65 minutes). Orvon Gene Autry (1907-1998) is considered to be one of America's greatest performers, gaining fame as "The Singing Cowboy" on the radio, in movies and on television, due to his yodelling talents. RIDERS OF THE WHISTLING PINES: This enjoyable western sees Autry being framed for poisoning cattle after villains destroy all the timbre in a government forest preserve. His search to clear his name and find the real culprits is accompanied by his usual repertoire of songs, with appearances from Jimmy Lloyd, Patricia White, and his most trusted companion, Champion. ROOTIN' TOOTIN' RHYTHM: Autry and his sidekick 'Frog' are suspected of cattle rustling in this action-packed western. After assuming identities of dead bandits, the duo devise a plan to get to the bottom of the livestock stealing, hoping it will lead them to the gang leader. Autry stars alongside Smiley Burnette, Monte Blue and Al Clauser and his Oklahoma Outlaws, with all of them performing The Old Home Place, Mexicali Rose, and the title tune, written by Sol Meyer, Jule Styne, and Raoul Kraushaar. In a career that spanned seventy years, Autry went on to become the biggest selling country & western singer of the mid 20th century, writing hundreds of songs, and starring in dozens of films and television productions.